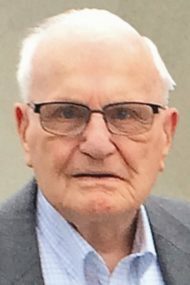 John R. Andrews, 95, of Landisville, passed away Sunday, February 3, 2019 at the Mennonite Home in Lancaster. Born in Philadelphia, he was the son of the late William and Bertha (Haller) Andrews. John was the loving husband of Maxine (Thornburg) Andrews, and together they shared 68 years of marriage. After graduating from Northeast High School in Philadelphia, John began working as a map reader for an insurance company while attending Temple University. He entered the U.S. Army honorably serving his country during WWII receiving two Purple Hearts. After the war, he went back to the insurance company and transferred to Pittsburgh. There he met his wife and began a family. During that time, he achieved his CPCU. John worked as a field agent for Donegal Mutual Insurance Co. and retired as the VP of Production. He was a member of the Sparks Club, Professional Insurance Assoc. and the Disabled American Veterans. John was a charter member of Wayside Presbyterian Church, Landisville, where he remained actively involved. Not one to sit idle after retirement, he sold Fuller Brush, worked and retired from the Manheim Auto Auction and volunteered at the VA Hospital in Lebanon, PA for 13 years. John enjoyed big band music, watching the Lawrence Welk Show and was an avid Philadelphia Phillies fan. Most of all, John loved his family and was especially proud of his grandchildren. (husband Robert), Dr. Cindy Lady (husband Sonny), and Linda Anspach (companion Larry Large). Also surviving are six grandchildren, Joe Hulbert, Chris Lady (wife Dr. Kristen Lady), Lance and Jason Spicher, Jessica Lady and Rebecca Gerth, PhD; and four great-grandchildren, Andrew, Jacob and Aleigh Lady and Lennon Field. In addition to his parents, he was preceded in death by a daughter, D. Jeanne Andrews; a son-in-law, Dan Anspach; a sister, Dorothy M. Elton and a brother, William H. Andrews. Family and friends are invited to attend a Memorial Service which will be held at 11 AM on Monday, February 11, 2019 at Wayside Presbyterian Church, 600 Stony Battery Road, Landisville, PA 17538, where the family will receive guests from 10 to 11 AM. In lieu of flowers, contributions in John’s memory may be offered to PA Wounded Warriors, 117 Country Club Road, Camp Hill, PA 17011, or to the Hempfield Food Bank, 85 East Brandt Blvd., Landisville, PA 17538. Sincere condolences to the Andrews Family. John was very nice man who we honored at the Pennsylvania Wounded Warriors, Inc. Gala, in Camp Hill, Pennsylvania, on October 13, 2018.Thank you John for your Military Service and for your Valor, at the Battle of the Bulge in Bastogne, during World War II. Sending our condolences to the family. We are deeply sorry for your loss. Hey John When i Get to Heaven i will be bringing you a special hotdog with those very special little onions you loved so much. I am honored to have met you in this life and blessed to have you and Maxine as neighbors. I cherish special memories i have of you. I promise to watch out for your Maxine that you love dearly. Btw….I know you are so happy eating sweet treats without anyone saying a thing about it! You will be missed but fondly remembered. oxoxoxox John.